The subtitle on this pizza is Homecoming Pizza, and not the dance/football game kind. If you're interested in the reason behind the subtitle, enjoy the recipe and meet me on the other side. But first, here's how to make this yummy pizza. Making pizza at home for the first time? 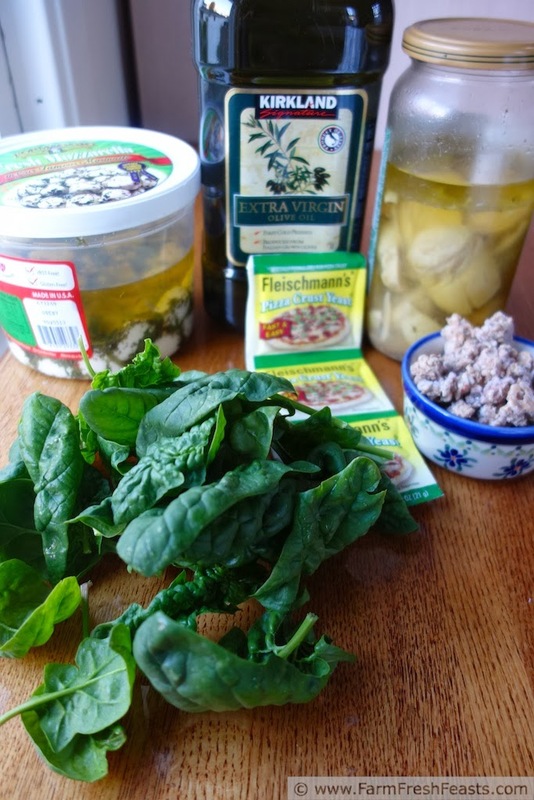 Please check out my Pizza Primer for all sorts of hints and tips to make your homemade pizza a successful experience. Preheat oven to 425 degrees Fahrenheit. If you've got a pizza stone--fist bump!--preheat it as well. If you don't, a gentle pat on the shoulder and a suggestion to use a cookie sheet. 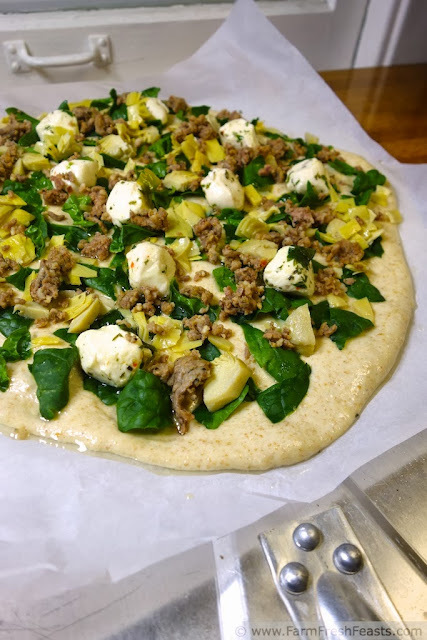 On an oiled piece of parchment paper (which will save your sanity, and I used the mozzarella oil for all my oiling needs this time) spread out the dough to a rough circle. Set aside while you do some cleaning or drink a hard cider, about 30 minutes, or go straight into the topping portion of the recipe. 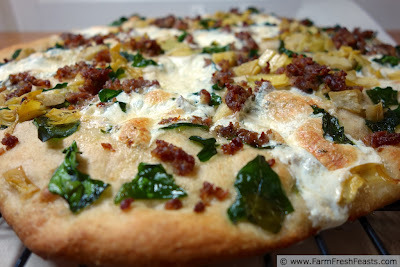 Brush the dough with oil, and top with spinach, artichoke hearts, and sausage. Carefully place mozzarella balls around the perimeter (not too close to the edge) and center of the pizza. I didn't put enough in the center this time, and will remedy that situation next time. Bake, with the parchment, on the pizza stone for 5-8 minutes, then shimmy the crust directly onto the stone to finish baking and allow the cheese to get bubbly, another 3-5 minutes. Cool on a rack, then slice (Amazon link to my favorite slicer) and serve. What kind of person picks up her spouse from the airport after a 4 day journey of over 7,000 miles, brings him home to meet the recently-adopted elderly wiener dogs (whose photos he fell in love with on the Warren County Animal Shelter website), feeds him leftovers for dinner, then puts him to work processing photos because it's Thursday night and there's a pizza recipe that needs to be posted? You decide what kind of person I am. I'm so happy to have my spouse back any uncharitable thoughts will bounce right off my glow. I'll probably feed him a slight variation on this pizza--with kalamata olives and bell peppers added--or we'll order take out and he'll pick and choose which focaccia bread he wants. 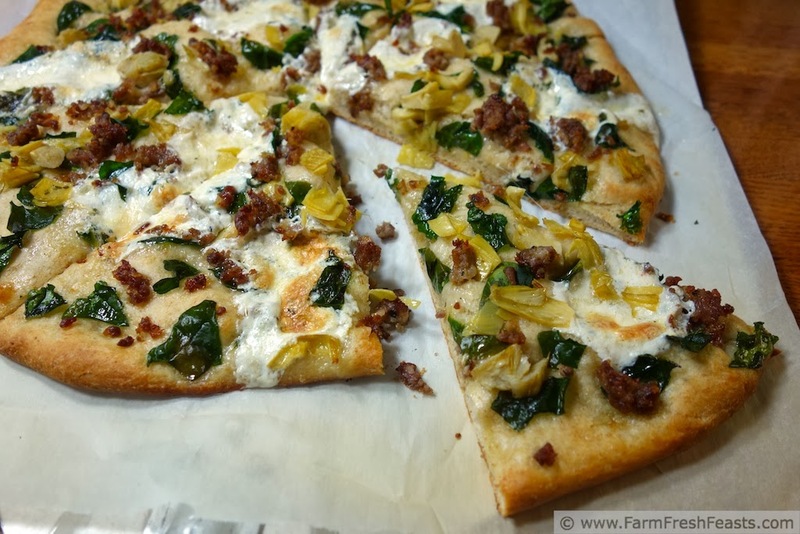 Because I keep a bag of cooked crumbled Italian sausage in the freezer and preserved vegetables in the fridge, it's easy to see spinach in the farm share and whip up a pizza combination like this. I like the yeast shown in the photo (coupons for it in the Sunday papers this time of year) because it's a great last minute pizza crust that doesn't fight you. This post is shared on the From The Farm Blog Hop, Clever Chicks Blog Hop, Tasty Tuesdays, What's Cookin' Wednesday, the Wednesday Fresh Foods Link Up. I'm sorry, comments are closed on this post due to excessive spam. If you are not a spam bot, I'd love to hear from you! If you'd like to share your thoughts, please go to my FB page. Thanks! The dogs are adorable!! I'm so happy for you that you have your hubby home! 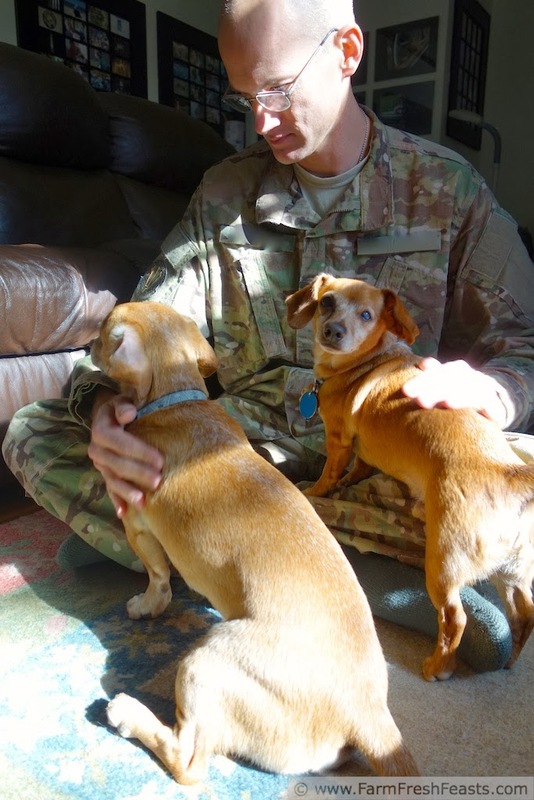 Tell him thank you, thank you, thank you for his service and for protecting us. The pizza looks fantastic - who doesn't love a good sausage and mozz pizza? And the artichokes sound like a lovely addition to contrast the richness of the sausage and cheese. Thanks! The spinach looks lovely, although not as lovely as seeing the Spouse unite (can't re here) with the recently adopted wiener dogs. You are the kind of woman who takes care of said wiener dogs when the spouse falls in love with them from half a world away. My husband would love this pizza. Probably because he's desperate for meat on a pizza after all my strange concoctions lately (egg pizza, although that would have been good with bacon). Bacon and egg pizza sounds very good to me right now. Apparently it's time for another bedtime snack of your granola--it's the only thing that satisfies my post-dinner munchies. It's delightful seeing them all getting to know each other--and the wiener dogs are getting middle names out of the deal. Vincent (the larger one) is now Vincent Barbarino. Oliver's middle name is still under discussion. I like Oliver Small, but it's not quite there. Simon;s middle name is Le Grue, I have no idea why but I seem to recall starting it. I love spinach in pasta, but I have never put it on pizza. I can't imagine how that happened! Ready to go get some spinach and try it out! And we are only a few months away from being able to plant spinach in the garden. I've just put the garden to bed for the winter and I'm already planning for next spring! We've been getting a bunch of spinach in the farm share this fall, and I'm so glad. I was really hoping for and missing it in the spring. It never occurred to me to plant it, but it sounds like a terrific idea--thanks for that! I keep thinking I'm done putting the garden to bed, but then more leaves come down and I hate to think of wasting them by having the city pick them up and compost them--so into my compost bins or onto my garden beds they go! Hi Kirsten! This pizza looks so fabulous! We are *just* now starting to get a box from Abundant Harvest, so I'll be watching your blog more closely from here on out. I definitely want to play with pizza and why reinvent the wheel when you've got so many recipes for lovely pizza combinations? I'm so glad you're getting a box! You'll love the fresh produce--though sometimes it's tricky figuring out what to do with it all! Right now I've got a whole bunch of leeks, carrots, and red cabbage in the fridge--at least 3 weeks worth of leeks and more of the carrots--and though I know they will keep for a good while, I've got recipes percolating at the back of my brain. Probably soup, as it's soup weather here. Thanks for featuring this pizza! You make the best pizzas! Glad you got your hubby back and big thanks for linking up with What's Cookin' Wednesday! (blushes modestly) Awww, shucks, thanks!